These hunters must have been borrowing heavily from the British traditions. Two setters or a setter and pointer in the cart and black retriever in the front. 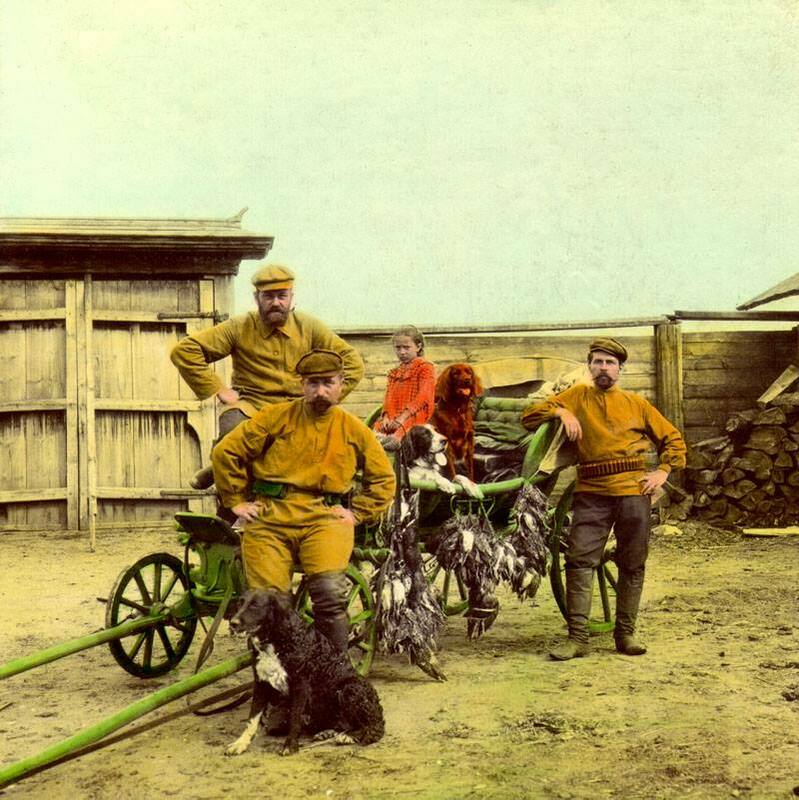 These men may have even been British who brought their dogs in the Russian wild for a some “primitive” rough shooting in the Irkutsk region of Siberia. I cannot make out the birds they were hunting. Maybe snipe? 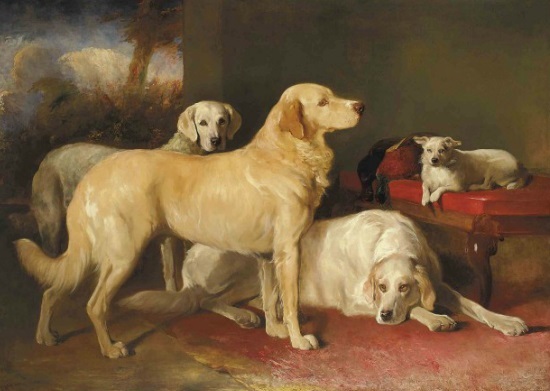 These are not “golden retrievers,” as Christie’s claims. The true golden retriever program wasn’t underway until the 1860’s. The painter was John Hamilton Glass, and the painting appeared in the Scottish Royal Academy in 1852. The dogs are fairly large, and the one in the one in the background looks very much like a British conformation type golden retriever. You can tell they are retrievers because the game presented are a pheasant and duck. Yellow retrievers existed long before the true golden retriever came about. And no, that terrier isn’t a Jack Russell, but you could call it that and not be entirely wrong. 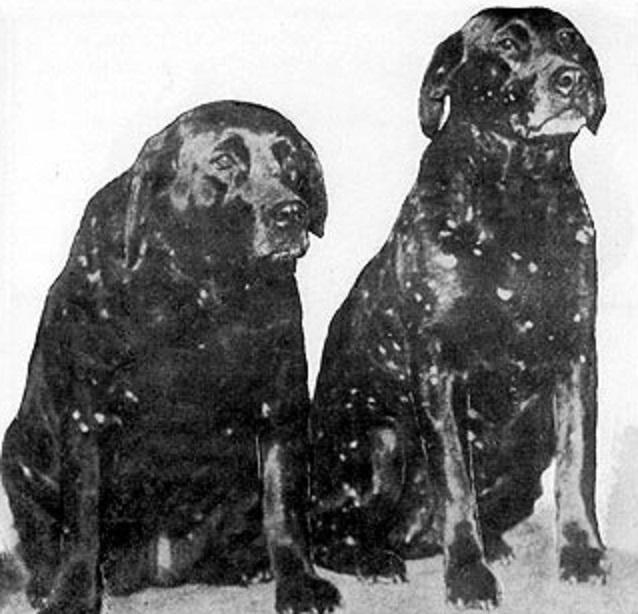 The dogs above are two purebred Labradors, and the white spots you see on the coats are not the result of the distortion or aging of the photo. This coloration is quite rare in Labradors, and because of its rarity, no one knows its genetic basis. It just occasionally pops up in Labrador litters. A very similar color also pops up in greyhounds, where it is much more common. The official name for the disease is called Ichthyophthirius multifiliis, but most aquarists shorten it to “ich.” It is also called “white spot disease,” because it is easily recognized when one sees small white flecks on the gills and body of an aquarium fish. The disease is caused by a protozoan called Ichthyopthirius that establishes itself on the body of the fish. Each white fleck is actually where a protozoan has set up a residence. These parasites wind up damaging so much of the skin and gill tissue that the mortality rate from fish affected by the disorder is quite high. Of course, these dogs aren’t affected by anything other than some novel color phase. It just happens to remind me of the deadly fish disease. 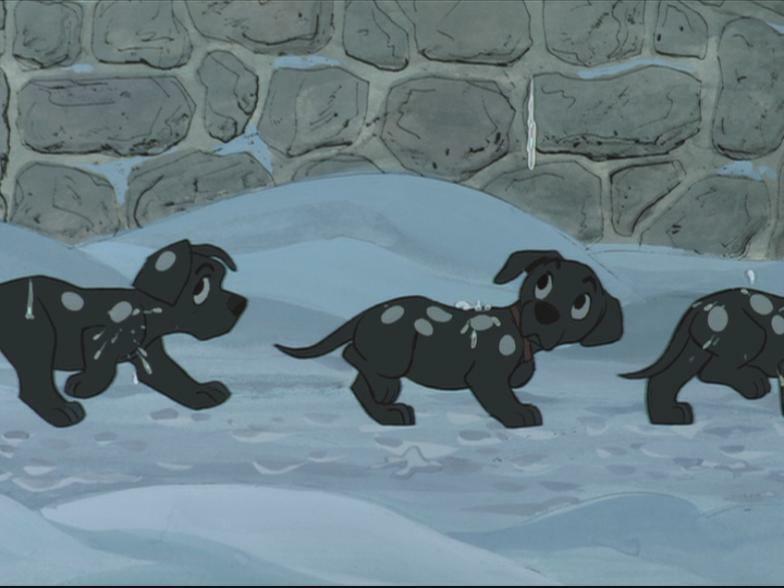 However, looking at these Labradors, I’m sure many will be reminded of the old cartoon 101 Dalmatians, where at one point, the Dalmatians try to sneak past Cruella de Vil and her minions, Horace and Jasper, by rolling themselves in soot and trying to pass themselves off as Labradors. Everything goes according to plan, until melting snow hits the dogs’ coats, revealing that they are Dalmatians and not Labradors. (BTW, if you can’t tell the difference between a Labrador and a Dalmatian that is dyed black, there is no hope for you!). This painting was done for Currier and Ives, and if you want to see romantic portrayals of America from the nineteenth century, look up Currier and Ives prints. The ducks are a species called a redhead, but I think are better called “American pochard.” They are very closely related to the pochard duck of Europe. 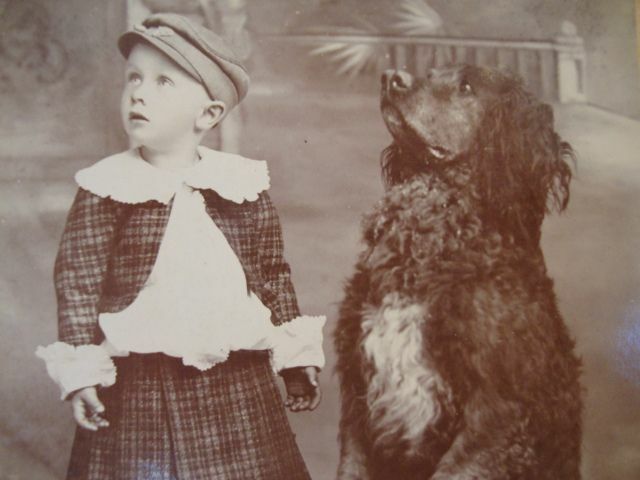 The British often complained that American setters weren’t as staunch to a point as their dogs were, and they blamed it on the dual purpose function of our setters. In fact, it has been claimed that the popularity of the retriever in Britain largely resulted in the desire to have setters and pointers hold their position. They could breed and train for a dog to hold the point very tightly, while another dog did all the retrieving. But Americans used our setters just as the Europeans used their HPR’s, and this is why outside of those two regional breeds, retrievers did not exist in significant numbers in the US until after the Second World War. Our setters did the job. 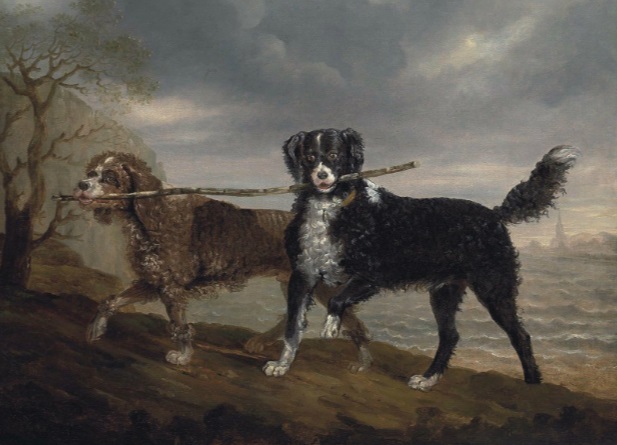 These “spaniels” were owned by Mrs. Orby Hunter and were painted by Ben Marshall. Diver is a barbet/English rough water dog/poodle type of water dog, but Shuckleback looks like a proto-curly coated retriever. Maybe a bit of St. John’s water dog had been crossed in, or maybe he was of a sort of water dog that is part of the St. John’s water dog’s ancestry. I imagine the Tweed water dogs being very similar to Shuckleback, just of the yellow or reddish coloration. From Stonehenge’s The Dogs of Great Britain, and Other Countries (1887). 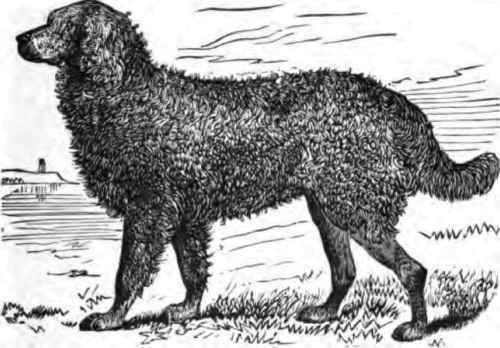 Dog was exhibited in 1877. 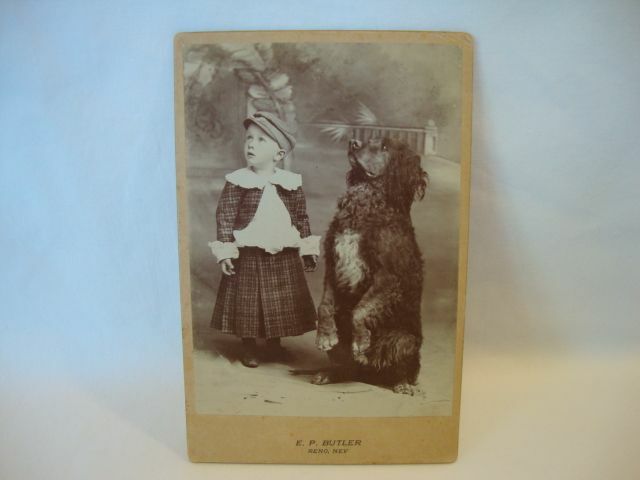 This old photograph is being marketed that of an Irish water spaniel, but it’s actually something much cooler. Irish water spaniels were commonly used as retrievers in the US, but the McCarthy type of water spaniel was invariably liver in color. And it never makes one double click on an image to make one wonder if a dog is actually a golden retriever. I think this animal is a red Winchester retriever, a type of long-coated retriever derived from the St. John’s water dog. It was said to have come from Ireland, but it may have been nothing more than a regional Irish variant of the early curly-coated retriever. 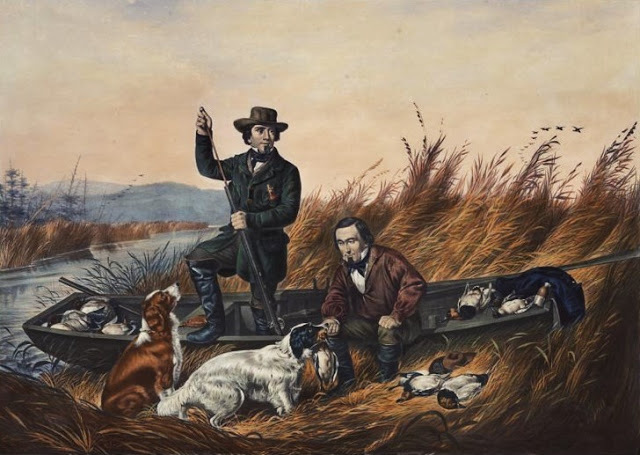 Such dogs were in demand among waterfowl hunters in America, and retrievers that were born liver or gold/red in color got exported to fuel the market hunters’ demands on Chesapeake Bay. This red Winchester type is sometimes regarded as a type of long-haired Chesapeake or a breed that got absorbed into Chesapeakes, which occasionally do have long-coated pups. We could have made at least three breeds out of the types of retrievers out of what became the Chesapeake Bay retrievers. This particular dog was photographed by Edward Payson Butler in Reno, Nevada in 1886. People settling in the West in those later days liked to hunt. The Frontier was just about to close off entirely,and people who had made their fortunes in places like Nevada were eager to get improved hunting dogs from back East or Europe. I should note that there were several names for this dog: brown Winchester, red Chester, and brown Chester. One story is that the retrievers that founded this strain came from a British ship called the HMS Winchester that was said to have brought the red, long-coated retrievers out of Cork to America’s Eastern Seaboard. Which of course, brings us back to the Duggan family water spaniels, which were also from Cork. Maybe this type of water spaniel is the ancestral red Winchester type that was then crossed with the endemic Chesapeake duck dogs to found the red Winchester, which then got absorbed into the modern Chesapeake Bay retriever. America’s retriever culture relied much more heavily on water spaniels and regional variants than the UK retriever culture. We preferred liver and yellow/red/gold dogs over black ones, while in Britain, the preference was for black ones. Golden, Labrador, and flat-coated retrievers have long, carefully documented pedigrees, but you will not find these documents in regard to curly-coated retrievers, Chesapeakes, or any breed of water spaniel. We produced dogs like this one. Just as our coonhounds were likely mostly drawn from the rejects English Old Southern hound packs, which were deer and hare specialists, our native retriever was drawn from the rejects of a culture that was obsessed with producing black retrievers. Our hunting and shooting culture is very different from the Motherland. We are a nation born of conquering pioneers, not of decaying feudalism. We were once a nation filled with game, and compared to the British Isles today, we are still teeming with wild beasts. We didn’t need a dog to say that we were up-and-coming. We needed a dog that had a purposed. And well-to-do people began to sport hunt as a homage to a past that once included a Davy Crockett, a Daniel Boone, and a Lewis Wetzel. Sport-hunting begat the modern conservation movement and then the science of wildlife management, and as America has grown wealthy, we’ve been able to save many species. We’ve been able to keep a bit of the frontier wildness about. We may not have the zapovedniks of Russia, but we still have enough wild or even “feral” places about. And here, people can keep dogs like this red Winchester’s descendants and take him or her into the places that remind one of that storied past. It’s never going to be the same, but it is a reasonable enough facsimile.